Working at Scene75 Cleveland during its first year of operations has provided me with unique opportunities and learning experiences, many of which I know will help me in my adventures later in life. Though Scene75 is not my first job, it has certainly been a very valuable one in teaching me about life and about business. As I reflect on Scene75 Cleveland’s inaugural year, I can’t help but realize how much I enjoy being a Scene75 employee. Over the past year, I watched and helped our location transform from a stagnant grocery store to the vibrant family entertainment center it is today. As we approach the Cleveland location’s one year anniversary, I think back to our training and how far our team has come. Last year at this time, games and attractions were still being installed at the facility. Shortly thereafter, I was trained at every attraction as an attraction team member. Some attractions, like go-karts, required additional specialized training while others I quickly learned within hours. As a well trained team member today, I enjoy watching each attraction in operation; it reminds me of how far we, as a team, have come! During training, we had to start and restart attractions to learn the most basic of operations. But now, as seasoned veterans of Scene75 Cleveland, we operate with a symphonic flow knowing where to be, what to do, and how to help our guests create lasting memories. Scene75 Entertainment operates and abides by an open door policy; our managers listen to our concerns and genuinely want to address them. It is not just lip service – it is practiced daily. Though some ideas may be brushed aside, I have noticed management takes notes of our concerns even when not implemented; they are always willing to listen and encourage all ideas to refine and improve the guest experience. I have learned in my year with Scene75 that we as employees are treated as people, not numbers; this is something I truly value and appreciate, as do many of my colleagues. While I love much about my job, one of my favorite responsibilities is being a member of the Scene75 Street Team! 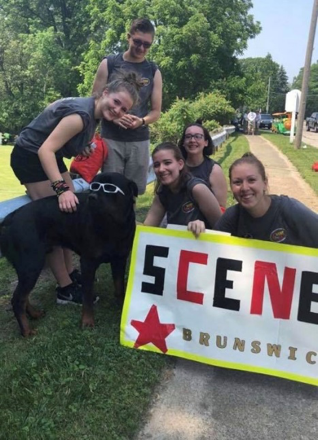 The Street Team helps to get the word out about Scene75, while sharing fun in the Cleveland area and beyond. I have now been on the street team for two summers; we have traveled to multiple places and met so many energetic, lively people. As a person, the Scene75 Street Team has really helped me branch out of my comfort zone; I have learned to be more bold and outgoing. The Scene75 Street Team has also allowed me to further explore my creative side. Whether marketing a special event or simply sharing our brand with the community, I love being able to represent Scene75 with such a unique team! 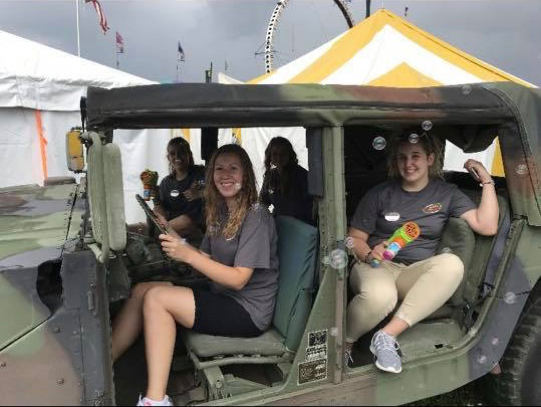 As a student who takes school work seriously, I appreciate that Scene75 allows its attraction team members to work flexible hours. Many Scene75 employees are in school; management helps us work around classes and extracurricular activities. Management wants us to be great employees, but they also want us to be great citizens. Over the past year, I have met a lot of people who have added great meaning to my work experience. Making connections is very important, and Scene75 has allowed me to do that in a fun environment. I am grateful for the people I have met. Overall, I have really enjoyed working at Scene75. I have found it to be a great platform for growth and learning. Everyone has been so supportive, and management gets to know us as people, not just as numbers. I have even found management to be supportive of my music career, allowing me to create two Scene75 theme songs! I have seen similar support for the goals and ambitions of others. As one year approaches since Scene75 Cleveland first opened, I have truly enjoyed creating lasting memories and sharing fun with co-workers and guests. I hope those reading this will visit us at Scene75. We really are a fun team and want nothing more than to create the best entertainment experiences for our guests.